I think I have finally figured out how to get my videos all uploaded (as long as each one is under fifteen minutes long). So…welcome to another Wondering Wednesday video! 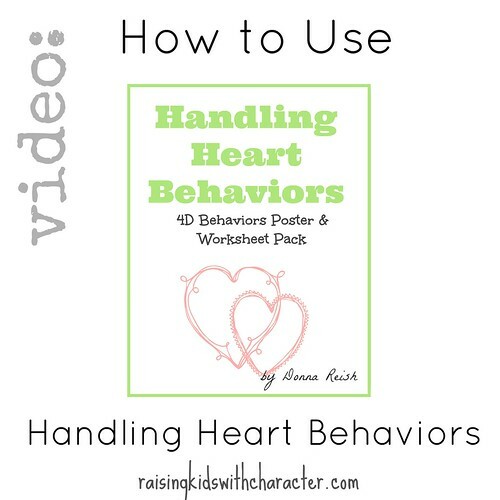 I have audios as well as blog posts (as well as entire sessions of Raising Kids With Character seminar and homeschooling workshops) on The Four D’s of Behavior and Handling Heart Behaviors, but I think a video suits this topic well with the poster packs and worksheets we offer (by the same name). “In this helpful parenting packet, Donna Reish (of Raising Kids With Character seminar, Homeschooling With Character seminar, and Character Ink Press and blog) offers three worksheets to help parents of tweens and teens work through some of the difficult heart behaviors (described in The Four D’s of Behavior podcast episode and Handling Heart Behaviors of Tweens podcast episode). P.S. Subscribe to our YouTube channel here!